The common ingredient across all the different kinds of sushi is sushi rice. The variety in sushi arises from the different fillings and toppings, condiments, and their preparation. The same ingredients may be assembled in a traditional or a contemporary way, creating a very different final result. 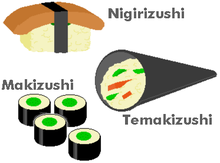 In spelling sushi its first letter s is replaced with z when a prefix is attached, as in nigirizushi, due to consonant mutation called rendaku in Japanese. The California roll is a maki-zushi, a kind of sushi roll, usually made inside-out, containing cucumber, crab meat or imitation crab, and avocado. In some countries it is made with mango or banana instead of avocado. Sometimes crab salad is substituted for the crab stick, and often the outer layer of rice (in an inside-out roll) is sprinkled with toasted sesame seeds, tobiko or masago. As one of the most popular styles of sushi in the US market and abroad, the California roll has been influential in sushi's global popularity and in inspiring sushi chefs around the world in creating their non-traditional fusion cuisine.